Tonight is the opening of JK Russ' exhibition 'American Dream' at Thermostat Art Gallery in Palmerston North, New Zealand. Although there's a time delay between New Zealand and where we are in the USA, we'll be available to Skype the gallery during the exhibition opening to say hi to those that make it to the show. The work will be viewable on Russ' website from tomorrow at this link here. 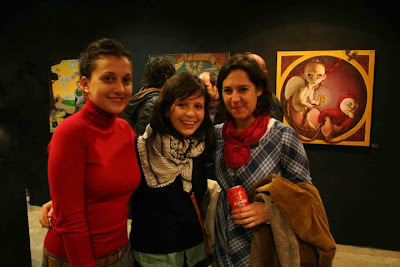 The link below features photographs from last night's opening of 'Away From Dios' at Galeria CMTV in Barcelona, Spain. It's a Facebook link, so you might have 'friend' them first to see the photos.